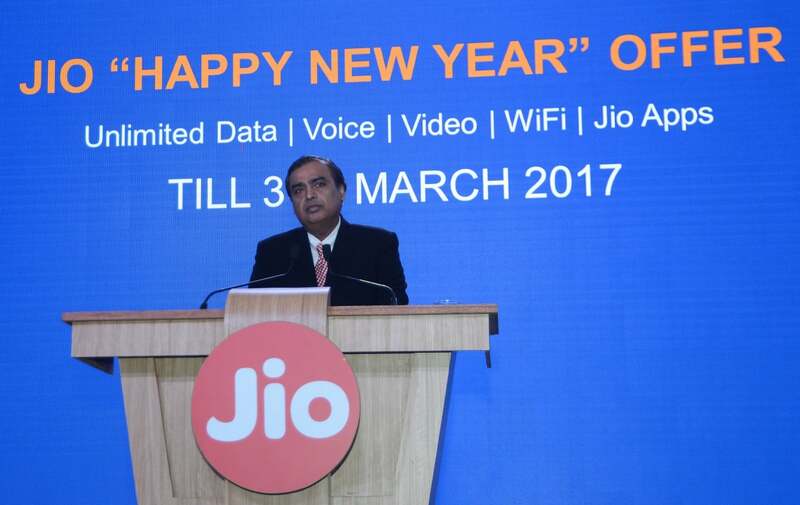 Mukesh Ambani, the chairman of Reliance Jio Infocomm, today announced the extension of welcome offer as ‘Jio New Year Offer’, which extends the free 4G services up to March 2017. While the earlier introduced ‘Welcome Offer’ offered us 4GB of data limit per day, that isn’t the case with the New Year Offer as the company capped the data limit to 1GB per day. According to Mukesh Ambani, in India, not more than 80 percent of users use mobile data above 1GB per day. So, that is the sole reason why RJIL is reducing the data limit to 1GB per day. Same as the case with the welcome offer, after exhausting the daily FUP, the data speeds will be reduced to 128 Kbps, which will be useful only for sending or receiving WhatsApp messages. Having said that, if you’re the one who wants to enjoy high-speed internet even after exhausting your daily limit, then Jio got you covered. Yes, Reliance Jio officially launched two data top-up vouchers with which the FUP limit will be increased. At the time of the Jio New Year Offer announcement, Mukesh Ambani hasn’t revealed any information regarding this top-up packs, but later on, we dug into the company’s official site and had got this information. As said earlier, there are two new plans and the first plan costs Rs. 51 and gives you 1GB of data with 24 hours of validity. Do make a note that this one-day refill pack expires after 24 hours from the time of your recharge and it won’t expire at midnight. Another pack costs Rs. 301 and comes with 6GB of data along with a validity of 28 days. It is worth noticing that these recharge kits will only come into play after you exhaust your daily data limit of 1GB. Furthermore, these recharge packs will be applicable from December 4 for new users and for existing Jio welcome offer users, they will be applicable after December 31. The recharge can be done through MyJio app, JioMoney app or by heading over to the company’s official website- Jio.com. Both the postpaid and prepaid users of Reliance Jio are eligible for this offer. Why Smartphone Manufacturing Companies Are Extensively Focusing on 4G VoLTE Devices? Munnu wants 10 GB per day. Lol. Petition Jio to increase post fup speed to 256kbps.